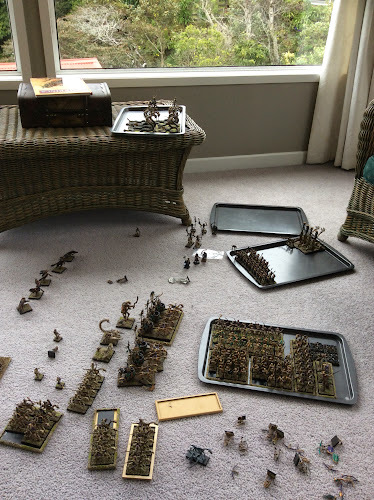 Last weekend I got my Tomb Kings back from Sam who had used them earlier in the year. The last couple of days have seen a cold southerly blast Wellington so I took the opportunity to get the army out and make some repairs for minor breakages that it has suffered over the years. So here it is spread over the floor in our front lounge. 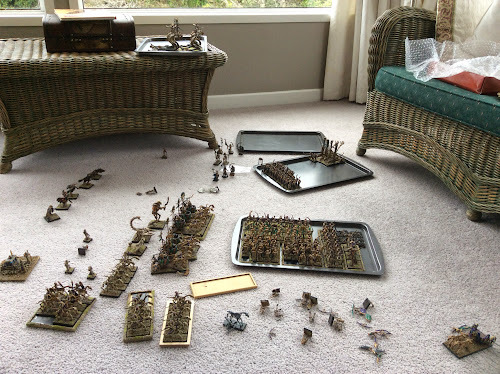 The tray in the middle has two blocks of 25 Sword & Board Skeletons and three blocks of 20 Skeleton Archers. Behind it are 40 Tomb Guard and two Catapults. Earlier this year I painted 15 Skeleton Light Horse and they are in the bottom left. On the far left is my Casket - the Priest is missing but I have hiss two arms ..... Bizarre. On the table are 8 Necropolis Knights - I have another four unpainted but I think I'll flick those. Looking to finish the army off this morning I ordered sufficient Sarissa trays to cover those that haven't got them. That will be a project at some time in the next month. There are a few characters to paint - including the Limited Edition BSB who came with the TK box set over a decade ago. All up there is well over 4000 points once I add in the Warsphinx and Necrosphinx I have downstairs. Hey Pete, Ryan and I would probably take those Necro Knights off your hands.